How many acronyms can you fit in one sentence? Please see the above headline, which pertains to a settlement reached by the Securities and Exchange Commission (SEC) that will see the NASDAQ (National Association of Securities Dealers Automated Quotations — the more you know!) 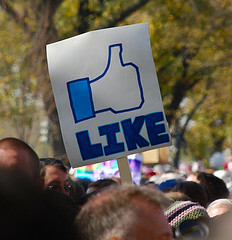 paying out $10 million for bungling Facebook’s IPO, or Initial Public Offering last year. Whew, try saying that sentence three times fast. Or even once. This is the largest penalty ever to be paid out over an exchange, and it’s because of violations of securities laws related to “its poor systems and decision-making during the initial public offering (IPO) and secondary market trading of Facebook (FB) shares,” the SEC said in a statement, via CNNMoney. You might recall all the brouhaha about Facebook’s IPO last year, when everyone thought it would just be the most exciting, thrilling IPO ever in the entire history of all the world. And then came the problems. Shares started trading a half hour late, traders complained that their orders weren’t being completed and others were getting shares at higher prices than they’d expected. Metaphorical fists started flying in the form of lawsuits and Nasdaq took a lot of heat for mucking things up.